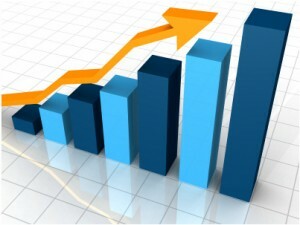 SM Metrics- Getting beyond followers, klout, and social butterflies! More Metrics Insights- Really? Haven’t we had enough? I’ve been following all the “buzz” over the past week from #SXSW and now #eMetrics regarding the development, reporting and use of “metrics” in Social Media (SM) space. Quite interesting dialogue to say the least. For some of you, particularly those who don’t live and breath Social Media, all of this may have turned into “white noise”, as this weekend appears to have exhausted just about every angle on the subject of SM metrics that we could possibly explore. But fear not! As another week kicks into gear, there will no doubt emerge a new wave of posts and blogs on the very same topic. But I must admit, that all of this “metrics talk” does strike a chord with me. After all, having spent nearly two decades in helping company leaders and managers get their arms around business metrics, and the broader discipline of performance management, you would expect my ears to jump up at the word “metrics”! (I know…sad but true). And while SM is not an area I have spent an enormous amount of time studying or participating in from “the inside”, I am finding that many of the same principles I use with my “corporate clients” and very much “in play” for this new and ever evolving market. While my life does not revolve around advances in SM, I have become what one might call a “steady user” of it. From my evening “blogging” hour, to ongoing “check-ins” via Twitter, Facebook and LinkedIn; I would confess to spending at least 10-15% of my ‘awake time’ interacting with online friends and colleagues. Of course, like many of you, Social Media (which for me includes my morning time with my Pulse reader scanning news and blogs that I monitor) has replaced the time I spend reading newspapers, magazines and “industry rags” (in fact it’s become much a more efficient medium saving me lots of time and energy). And those ongoing “check ins” that I initiate, usually occur when I am either ” restricted” (cabs, airports, etc. ), between tasks, or otherwise indisposed (I won’t elaborate on the latter- you get the idea).But the “blogging hour”… that is something separate for me, and while I do enjoy it and it helps me unwind, I also recognize it for what it is- a personal and professional investment in my own development. So yes, you could say that SM should be important simply because of the 15% percent of my day that I rely on it for. But for me, it goes a little beyond that, especially now that the conversation has turned to metrics, and the broader issue of managing SM performance and results. Ever since I got into the Performance Management discipline years ago, I’ve been a strong believer and proponent of finding ideas and insights, wherever they occur (different companies, different industries, different geographies, etc. ), and applying insights to current challenges within our own environments. Some would call this “benchmarking”. Others may call it good learning practices. For me, it’s not only common business sense, but a core set of principles that I live and manage by. And for many like me, it is the basis of any good Performance Management system. So it’s only natural for me to observe what’s going on in this space and try to open some good “cross dialogue” on how we can lift the overall cause that I know we all are pursuing: More effective measurement, better management of performance, and stronger results. A few weeks back I published a post on what businesses outside of SM space could learn from what is happening within SM. Many of you found that useful, although I must admit that it was the first time that I really began experimenting with what was available out there in terms of thinking andtools. But rather than focusing on the tools, I tried to explore some of the bigger themes that were emerging in terms of practices and approaches, and attempted to determine which aspects of that thinking in SM might be be “import-able” by other sectors as “lessons learned”. Today, I want to ‘flip the tables’ a bit, and talk about what other industries can teach Social Media about the art of measuring, improving, and delivering on our individual goals and aspirations. I was inspired to go this direction by a number of posts over the weekend that appeared to delve into the same question (here’s an example regarding the measurement issues with Klout) When I read that, it sounded like some good stuff, I realized that this was really the tip of the iceberg on a really important issue. So expanding on this seemed to be the next logical step. So what Can SM Learn From Others? The below observations are based on merely a snapshot of what I see taking place now, and fully realize that dialogue is occurring at this very minute in certain hotel bars and restaurants on this very topic. My goal is not to suggest an exhaustive list of “fix it now’s”, but rather to open an ongoing dialogue on what we can learn and apply in our individual areas of expertise. Is what we’re measuring today meaningful? OK, let’s get some basics out of the way, at the risk of boring (or offending) some of the social media pundits and ‘real experts’ out there. For most users (consumers of Social Media)- the everyday user of Facebook, LinkedIn, and Twitter, for example- the answer to ‘whether or not SM measures are meaningful ?’ is “probably not”. Save for ego and vanity, measurement of things like the number of “digital friends” (Facebook friend counts and Twitter followers for example) mean very little to the nature of managing meaningful relationships- whether it is in maintaining existing ones, or growing new ones. Meaningful relationships go way beyond these surface level statistics. Of course, there are those individuals and businesses who do use, and rely heavily on, more in depth statistics for tracking their progress. So I believe at least some of them would say “yes- meaningful…but with a lot left to be desired”. The stats and measures are there. Are they meaningful and value adding to the business? Subject to debate. What we can be certain of, is that things like Follower counts, Klout scores, Retweets, and Click-through’s are measures that are becoming less and less valuable, and that there is a deep yearning for more. Whether this takes the form of refining what’s in the algorithms and “black boxes” , or a major rethinking of the metrics themselves (which would be my vote), still appears to be a subject of great debate. When I see that level of measurement/ quantity of metrics, a little “warning sound” goes off in my head and I start exploring the question: “For the sake of what?” are you measuring this or that? I use a variety of techniques to get them to tell me how they are going to use a certain metric (most often the question of “why?” asked repetitively works best), but often the question is rhetorical because there is no answer. I once heard someone say, “If you want to see if information is valuable, just stop sending out the report and see if anyone screams!”. Fact is, if a measure doesn’t have a causal link to some major result area, or worse, if the person managing it cannot see that link, the metric serves no purpose other than to consume cost. Most of the tools I see in SM space for tracking metrics simply report stats with no obvious linkage to any real outcome. Even if something like # followers was important (and we all know that most often it ranks pretty low), there is no clear path evident in the reports on how the stats actually impact an outcome that is important to the user (other than loose descriptions and definitions at best). Yet, we all know that the tools and models for establishing those linkages exist everywhere. Just look at some of the basic tools used by stock traders. While they are not perfect by a long shot, “technicals” like Stochastics, Bollinger Bands, and simple breakout patterns, have clear paths to a high probability event or outcome, yet are available to even the most amateur investor. Even “stogy” old Utility companies can draw connections between things like permit rates, new connection activity and downstream staffing requirements. I’m not suggesting it’s easy, just that it’s important and that the tools are there to execute and simplify. For me, this is the MOST IMPORTANT item on the list. Most of us have seen the Klout site, Twitalyzer, and the myriad of other tools out there to support the development of personal networks. These tools are extremely useful, and possess a wealth of information if you have the time and stamina to think about what it all means. I mean, come on… to have 25 metrics on one page with trends only one click away is something that a real metrics guy can only look at and say “WAY COOL”. Seriously, very cool! That’s the good news. The bad news is that it’s the same news for everyone. But we all know the dangers of “one size fits all”. I’m not diminishing the value these tools provide. SM would be lost without them. And in their defense, certain sites like Twitalyzer and Klout have gone beyond the simple dashboards and have incorporated categories that many aspire to, and have begun to draw some connection between these aspirations and those broad categories. 2) a guidance system that helps one use the metrics to achieve those goals. So here’s a thought…What about a simple interface that allows you to pick a goal, and then tells you which metrics you should care about and what the target should be to accelerate within that goal class? You’d be building a model that would clearly feed on itself. I’d be surprised if the BI guru’s out there don’t already have this built into their corporate BI suites and Web Analytics tools, but it would seem to me to be a great draw for the myriad of other users with goals that extend beyond butterflies and mindless follower counts. Absolutely and without question, the answer is yes. But just as other businesses and industries have jumped too quickly, often placing ‘technology before process’, so has SM in my view. Part of this is because of how the industry is “wired”, and how it has evolved. Born through technology, and managed and staffed with a heavy technology bent, it’s not surprising that we’ve reached a point where the data has become king, UI’s have a lot to be desired. I’m not talking about the ease of navigation, the placement of charts, or the rendering of drill down information. I’m talking about how the user (the customer) thinks…starting with their goals, and accessing the relevant metrics to show progress and critical actions they need to take to improve. I suspect the developer who can “visualize” (to use an overused term in today’s SM environment) that kind of “line of sight” will ultimately win the hearts of its users. The other role technology can play is enabling the algorithms and models that are required to deploy the kind of “mass customized”/ goals oriented solution I described above. Without these tools, the likelihood of being able to normalize, analyze and model these relationships would be impossible. So in my view, the tools are critical, but the effort first needs to be on the process (getting the line of sight understood) and then working the raw data in a way that renders it in a context-specific visualization. That’s in a perfect world- but it’s still a good aspiration. Like I said, these are just the things that are ‘top of mind’ for me at the moment, and only informed by the lens through which “Bob” is looking. I’m sure some of these issues are top of mind for you too, and you may actually be unveiling (right now) that new “holy grail” subscription site that has the answers. If so, great…I may be your perfect customer. But if the last two decades have taught me anything, it is that different perspectives and different lenses often pose new questions and spark new crystal balling that lifts the entire game. Of course I welcome any comments and expansion on the above list. As I said earlier, this is just the beginning of my own thinking, inspired in part by some of yours. I look forward to more of yours! Data, information and metrics: Are we better off than we were 4 years ago? This entry was posted in Business Intelligence, Corporate Performance Management, Enterprise Performance, KPI, Performance Management, Performance Measurement, Social Media by Bob Champagne. Bookmark the permalink. I think you addressed a number of concerns here that are at the top of mind for many Social Media users. I too am concerned when I see metrics that offer data with no relevance to managing to your goals. I am very fond of what I call the signal to noise ratio. Of the current metrics, how many actually affect or change behaviors? 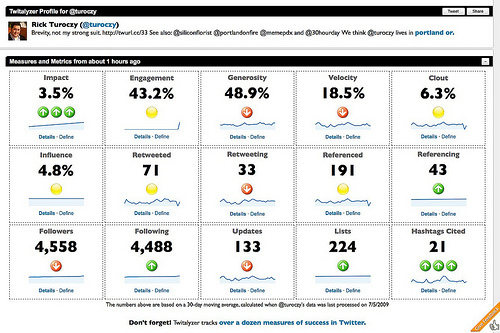 Of the tweets in your Twitter stream, how many do you actually read? Of those, how many are actually relevant to you? Similarly, getting traffic to your site is meaningless unless the people are actually interested in your product or service. How many are truly interested in your product or service compared to those who are simply passing by? We quickly learn that the signal to noise ratio is likely quite low. To that end, I contend that Social Media is about people first. We learn early on to find out who and what matters and determine our own rules of engagement. Great post Bob. I think at the moment we are seeing the “Show me the numbers” syndrome at play in the SM arena. From my experience as a performance measurement professional, I have come to the realization that numbers alone do not make out the whole. As Redge has mentioned, SM should be about engagement. It is this engagement with people that is critical to building sustainable long-term relationships capable of being turned into positive cash flow and profits in the future. 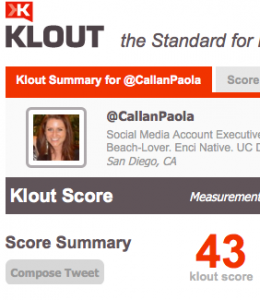 There are some influential people I follow but do have a Klout score below 50. Does this mean the opposite? I personally don’t think so. I still learn a lot from them. I do not engage with them because they have many followers or other great scores. For me it’s the influence and impact they exert on me. Well said Peter. That is exactly my point (or one of them at least). 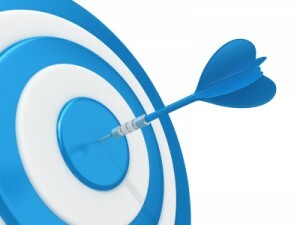 I am of the opinion that the metrics AND the targets should vary depending on the specific and unique objective of the user. It appears (and admittedly, I haven’t seen everything out there), it appears that they are trying to aggregate formulaic metrics into things like Klout scores inside of a black box. And while they have a few cute names for “standard objectives” (butterflies, thought leaders, etc…), these are far from the universe of objectives out there. One way they can do this, and still maintain proprietary algorithms is to let you “dial in an objective (from maybe a list of 10 attributes, or some combination of those 10 (like say, “thought leader” type, “technology/ social media bias”, interested in driving grown in EU clients) and “, and then it suggests 5 metrics and appropriate targets for your journey..